December 14, 2012 is a historic day. President Obama signed the Magnitsky Act, that ceases the application of the Jackson-Vanik amendment and affirms America’s commitment to defend human rights for those people whose human rights are violated. December 14, 2012 is a historic day. In the Oval Office this afternoon, President Obama signed into law H.R. 6156, which ceases the application of the Jackson-Vanik amendment and extends Permanent Normal Trade Relations (PNTR) treatment to the Russian Federation. In the memory of Sergei Magnitskiy, this new law also affirms America’s commitment to defend human rights and press for justice for those people whose human rights are violated. Passage of this landmark legislation is good for both Russia and the U.S., as it will expand our trade, and increase the mutual investment that is essential to promoting economic growth in both our countries and to creating new and better jobs. Trade between Russia and the United States has grown in recent years, but there is so much more that we could be doing. Russia is the 7th largest economy in the world, but only our 20th largest trading partner. Yet, for many U.S. states, exports to Russia are growing faster than exports to the rest of the world. According to some estimates, Russia’s accession to the WTO and the approval of PNTR for Russia could set the stage for U.S. exports to Russia - $8.3 billion in 2011 - to double in the next several years, adding jobs in services, agriculture, and manufacturing. Russia’s exports to the United States should likewise expand dramatically, as Russian companies secure greater access to the world’s largest market. Russia now will enjoy trade advantages that other nations with PNTR status receive. This new, normalized trade relationship will create new possibilities for mutually beneficial trade and economic partnerships between American and Russian businesses in fields ranging from farming to technology. This is indeed a good-news story for both of our countries. The new law also brings attention to Sergey Magnitskiy who, in the process of exposing corruption, was subjected to unfair imprisonment and a tragic death at the hands of the very officials he was exposing. Despite widely publicized, credible evidence of criminal conduct resulting in Magnitskiy’s death, after three years, authorities have failed to bring to justice those responsible. However, this new law is not anti-Russian and involves no extraterritorial measures. It is about U.S. sovereignty and the ability to keep those complicit in human rights abuses or corruption from entering the U.S. or using U.S. financial institutions to harbor illicit gains. The Obama administration shares Congress’s goal – which is also a goal of most Russian citizens – of promoting respect for human rights in Russia. The termination of the Jackson-Vanik Amendment’s applicability to Russia also removes a long-standing irritant in U.S.-Russia relations. When originally passed in 1974, Jackson-Vanik represented an important legislative act to respond to unfair restriction on Jewish emigration from the Soviet Union. For me, this issue is of special importance since it was my interest in the Jackson-Vanik amendment, the plight of Jewish refuseniks, and a commitment to see trade between our two countries increase that originally sparked my interest in Russia as a high school student in Montana more than thirty years ago. The problem that Jackson-Vanik intended to address disappeared long ago. Today there is free emigration from the Russian Federation, strong ties and easy travel between Israel and Russia, and a real renaissance of the Jewish community within Russia. 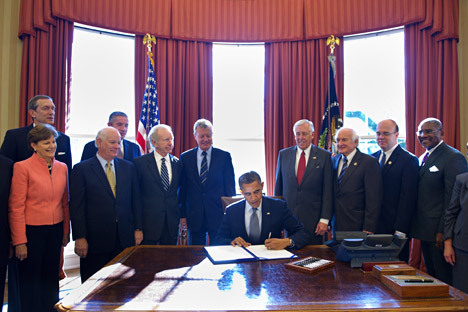 As the original intents of Jackson-Vanik were fulfilled long ago, I personally am delighted to finally see President Obama sign this law into effect today. The U.S.-Russian relationship is extensive and vitally important. The expanded opportunities for trade and investment manifest in Russia’s entry into the World Trade Organization and our extension of permanent normal trade relations comprise a milestone in our bilateral ties. Let us continue to work together across the spectrum of issues to further deepen and enhance this relationship based on continuity, predictability, and stability. Michael Mcfaul is the U.S. Ambassador in Russia. Read the original here.